I have been in Arkansas for the last week and the trees there are beautiful and starting their autumn show. 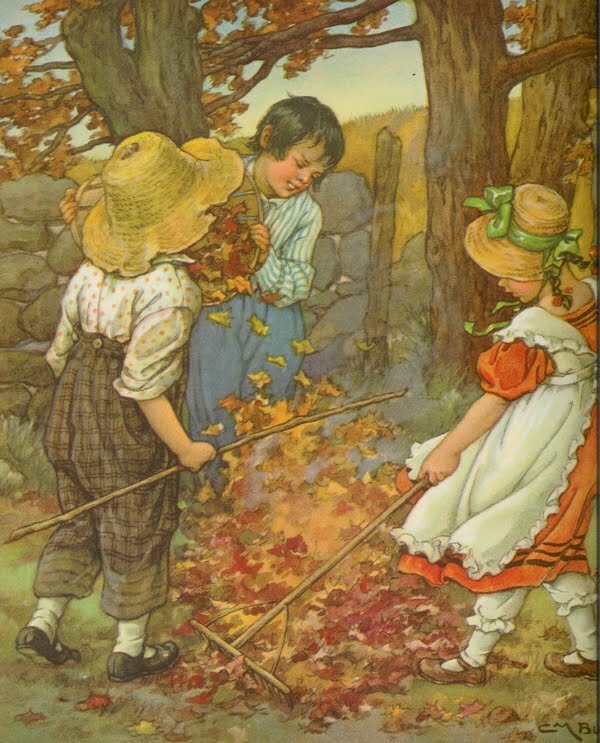 This little picture is from A Child's Garden of Verses and has some pretty fall colors. I want to announce the winner of my first giveaway! Congratulations to Pam from Treasures-n-Text. So sorry about the delay. I got back from my Dad's after spending a week there and am happy to report that he is slowly feeling better and gaining strength. I brought him back with me and he will stay here at least until we have our annual mini reunion with his sister and my brother. We appreciated all the comments and thoughts and prayers sent our way. Am slowly getting back to my routine and I really missed checking everyones blogs. It's good to be home! Welcome back and congratulations to the lucky winner. Enjoy your special time with your dad. I'm so glad to hear your Daddy is on the mend and beginning to feel better. That's so wonderful you were able to bring him home with you and you can give him lots of TLC and cuddles. Thank you so much for your sweet comments on my blog, especially re my brother. I wonder sometimes if the heart ever stops breaking? Congratulations to Pam on winning all those great goodies! Please know you and your Dad continue to be in my thoughts and I'm sending hugs your way. Glad you are home. Missed your lovely posts. I don't think my first post went through. So I'll try again. Thank you so much. I'm so excited to receive the great goodies. Can't believe I won. Please email me your email address at fabricartistpam@yahoo.com and I will send you my address. I can't locate your email here. Again thanks so much. I'm "really - really" excited. The box was awaiting my arrival home. I'm so excited to receive all the treasures. 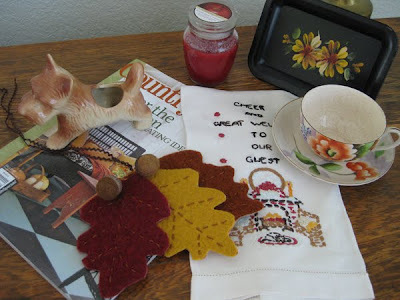 Love the dog planter, the cup and saucer, the candle, felted leaves, magazine, vintage towel, vintage tray, and of course chocolate. Thanks again. So cool to we a winner!